Hello Everyone! This travel blog covers our long incredible trip to China. Some of the highlights - Lijiang, Shangri La (Zhongdian), Guilin, Yangshuo, Xi'an, Beijing and Shanghai. 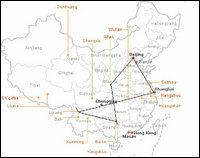 We are including excerpts from guidebooks (Frommers China 2nd Edition) and internet sites (www.chinadiscover.net) describing what we plan on seeing or have seen. Those excerpts are in italics. (At the bottom of each journal, click the link to the Slide Show to view the pictures for that day. Click on a thumbnail to start the slide show). We hope you enjoy our descriptions of what we saw and experienced.